Friday’s Racing: Sponsored by Wood & Stone Floors. The final day of the Sonata 2018 Nationals saw the strongest winds of the week, with three crucial races to decide the final standings. Today’s racing was kindly sponsored by Wood & Stone Floors. With gusts of 20+ knots, everyone started under #2 jib with the notable exception of Old School who carried their #1 all day (and still sailed significantly flatter than most of the fleet!). Dark clouds and large gusts made for dramatic survival conditions downwind, with some huge wipe-outs keeping the safety boat crews and photographer entertained. White Noise (Medway Y.C.) took the win in races one and two, with Exposition (Poole Y.C.) winning the third. Whilst the committee boat team are keeping the overall results secret until the prizegiving, we understand that Exposition has won overall, with Old School and White Noise taking second and third respectively. Crews are currently sharing stories of breakages and crash gybes in the bar prior to the championship dinner this evening. Thank you to the volunteers, staff, and competitors for making the 2018 Sonata Nationals at Medway Yacht Club a year to remember! Thursday’s Racing: Sponsored by Pirates Cave Chandlery. Day four of the Sonata National Championships arrived with a windy outlook. Racing today, incorporating the long-distance race, was kindly sponsored by Pirates Cave Chandlery. The morning started with a windward/leeward course in the strongest wind seen so far this week. Dark storm clouds appeared on the horizon on the third lap, and crews knew they were in for a soaking. Torrential rain arrived with squally winds, and only the braver crews flew spinnakers for the final downwind leg. Exposition (Poole Y.C.) continued their fine form to take the win. Competitors donned oilskins after finishing and tried to dry out for the next race. The long-distance race started a touch too aggressively, with a general recall required after several boats were over the line alongside some minor collisions. The second start was much more clean, with the fleet tacking up to the Pirates Cave inflatable mark before bearing off for a tour of the river. Lighter winds and strong tides set the scene for some tactical racing. Local boat knowledge came into play, but visitor Exposition excelled to take a second win of the day. The results are poised for some tight and exciting racing on the final day tomorrow, with everything to play for. With tapas and wine tasting this evening, there may be some sore heads in the morning! Day three of the 2018 Sonata Nationals saw four hard-fought windward leeward races in perfect conditions, with racing sponsored by Craftinsure. The ebb tide became a tactical factor as the day progressed, with local boats leading the fleet into the shallows. Visitor Old School found the mud at one point, although this was inevitable after they announced to everyone that they don’t have a depth sounder installed! 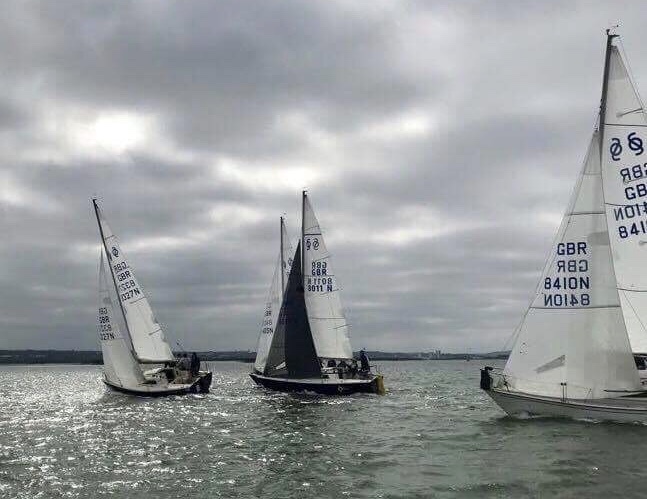 White Noise (Medway Yacht Club) became the second home boat to take a win in race one, with Old School (Royal Gourock Yacht Club) continuing their impressive run in the next. 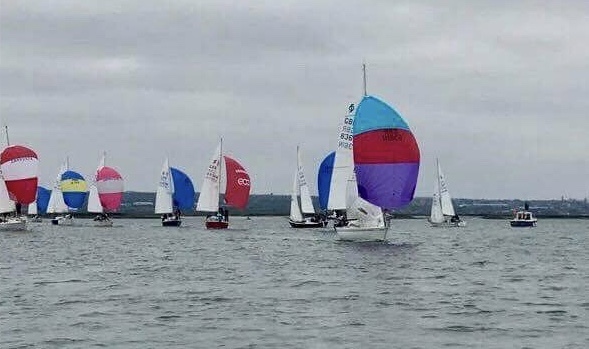 Race three saw Wasp (Poole Yacht Club) winning their first race, with Exposition (Poole Yacht Club) taking line honours in the final race of the day and cementing their position in first place overall at the end of today. The wind looks good for tomorrow with the long-distance race scheduled alongside a couple of windward leewards. After the disappointment of Monday’s sailing being abandoned due to lack of wind, the 18-strong fleet eagerly headed down river this morning at the promise of some wind, with today’s racing being sponsored by RWO. Race 1 got underway in very light conditions, and with the tide kicking in the fleet struggled to reach the leeward mark on the second leg. When the wind died completely, crews desperately rummaged through their lockers to demonstrate their kedge-anchoring abilities. 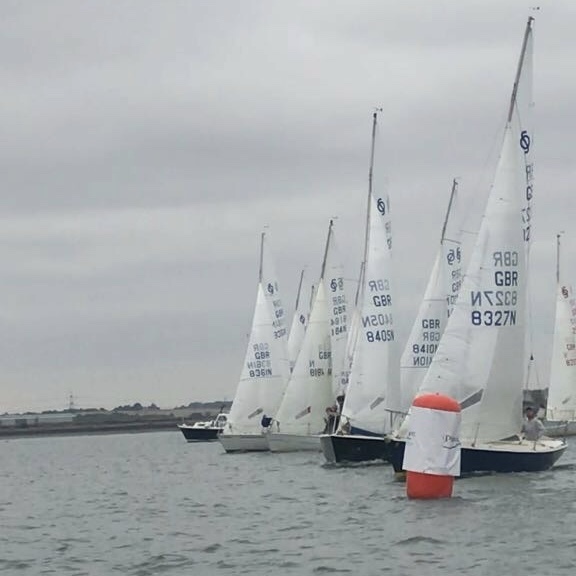 A long wait for new wind followed, and when it did finally fill in from a completely new direction, there was a big shake up in the standings, with Medway boat Red Dwarf II taking the first win of the week. Race 2 saw over-enthusiasm on the start line by the majority of the fleet, and a general recall was signalled. Everyone was better behaved under threat of the “I” flag, and close racing ensued with the wind direction mostly stable and the tide playing a big role in the favoured side of the course. Exposition from Poole YC took line honours. Races 3 and 4 followed in similar fashion in near-ideal conditions. Special mention goes to BD2 who broke their spinnaker pole but ably flew their kite poleless to good effect, and to winners Old School all the way from Scotland and Watersong representing Medway YC. Medway Yacht Club are pleased to be hosting the Sonata Nationals between 20th – 24th August. With 17 entries received so far from 6 different clubs this event will no doubt be highly competitive. The event will comprise a series of thirteen races with a maximum of four races to be sailed each day, races will be run over in windward/leeward courses apart from a single distance race which will will be run on one day. Monday – Two course dinner (£15 p/p) followed by a quiz night hosted by the infamous MYC Commodore, Mark Penny. Be prepared for fantastic food and questions where you are not sure if even the host knows the answers! Tuesday – “Hog Roast on the Terrace” (£15 p/p) with live music from Jez Gold and Andy Mac. Perfect way to enjoy the company of your fellow Sonata sailors and wind down relaxing on the Costa del Medway. Wednesday – We have left this night free for your all to have some time to yourselves and enjoy the local offerings that the Medway Towns has to offer. Of course, if you cannot get enough of Medway Yacht Club, then the galley and bar will be open serving food and a fantastic selection of drinks. Thursday – Tapas (£20 p/p) is the food of choice this evening, with one of the club’s local drink suppliers taking host position to guide you all through an evening of wine tasting. Great food, great wine and of course, great company! Friday – Regatta prize giving dinner (£35 p/p), with a three course meal and live music provided by Carl Burgess & The Rooster Boys. Formal attire and a great finale to the week of racing; this will be a great evening to celebrate what would have been a successful week of racing at Medway Yacht Club. Contact the club office to book places at any of these events.